What Post Production Software Do You Use Most? Time for another weekly reader poll – this one focuses upon post production software and will help us work out what to focus tutorials in our Post Production area upon. I’ve included the 9 most popular tools mentioned last time I asked this question to readers (a year ago). I know others of you use Photoshop 7.0, Noise Ninja, Bibble Pro, ACDSee and others – feel free to tick the ‘others’ option and tell us in comments below what ‘other’ one you’ve chosen. If you use more than one feel free to tell us about that too. I used to use CS4 and Bridge for all my uploading, organising and editing. Then, for some reason not yet resolved, Bridge stopped working. Now I use Picasa to organise my files and still use CS4 for editing. Like Johnny Inside said, I also use Corel PhotoPaint almost exclusively in Windows. I've used Corel Graphics Suite since version 3 and have been on their beta testing program for 5 different versions of the suite. It does the same things Photoshop does but has a significantly lower learning curve (and much lower price tag). You can also install many Photoshop plugins into it! It also supports RAW files. I've used Picasa a lot for organization but have been finding it more and more to take up a lot of system overhead. It can really slow your system down. I've started dabbling a bit with Lightroom. While confusing at first it seems to have great promise. I've started playing around with Photomatix Pro 4 for HDR images. Again, it's a little confusing at first, but that is a pretty slick program! If you use Linux, there's a great alternative to Adobe Lightroom. It's called Darktable. It's another workflow management program and it has many similarities to Lightroom. I also have been using a program called Entangle. With either Darktable or Entangle you can tether your camera and do live preview shooting in Linux!! Another couple of good photo management apps are F-Spot and Shotwell. As an additional tool to use besides PhotoPaint or Photoshop, I've been trying GIMP. It bears more similarities to Photoshop than anything, which means it also has a higher learning curve, but it's very powerful. Awesome app! Oh, did I mention it's FREE!!? I use Photoshop CS4 with a couple of NIK software filters, Mainly the tonal contras filter found in their Color Efex Pro suite, then de-noise the shot with Nik's Define filter. I use LR3 to organize and if working with RAW format. For .JPG files I use PSE8, if I need it and PICASA3 for small touch ups. I use Photoshop CS4 and a few plugins. I'm surprised that no one has mentioned a really basic but very versatile program - Windows Picture Manager. I know it's very much for amateurs (which I am) but it is easy to use and gives great results. It can crop, alter light and dark balance, colour tweaking, resize, straighten etc. with a very simple interface. It's also a great picture manager of my many thousands of pictures. If I need stuff it can't do (sharpen, or more advanced tweaking) then I use Photoshop Elements 6, which I've only just scratched the surface of what it can do. I would like to mention that for some reason I have not been able to access my RAW files at all (I got my Nikon D60 in October) so I'm looking forward to exploring the Capture NX(2) program mentioned in this thread. Once again, DPS to the rescue! Since I enjoy taking pictures I try to get the best quality photo at the time of capture so I don't spend alot of my time dealing with post-production. I personally find Aperture w/NiK plug in software collection (love the U-Point technoligy, very natural w/o artifacts) cuts my post production time considerably. But,....if you have a need for "constructing photo's" for the type of photography you enjoy you should consider Photoshop cs3 or cs4. I use Photoshop (CS4). I found that more plug-ins are compatible Photoshop than any other photo editing software. I too think you should have included Nikon Capture NX 2. Using NX2 makes my workflow a breeze. layers are great in PS, but with NX2 you don't have to worry about them, and there is no learning curve. Plus, the NEF raw conversion beats all others hands down. I'm an Aperture user. Its really straightforward and user friendly. If you don't want to get square eyes juggling with photoshop try it! Just in case I've insulted you, you can also set photoshop (or any other appropriate software) as an external editor. I'm just starting to do post production work, having just bought my first DSLR, so I'm using Lightroom and it's tutorials. I did manage to do a few things without having listened to the video tutorials, but am finding the tutorials somewhat helpful. I used to use Ulead Photoimpact, but that has been several years. I liked that it had a lasso tool and things that Lightroom doesn't appear to have. Or maybe I just haven't gotten that far in the tutorials. i use photoshop cs3 i think there is no substitute of this in the world of graphics, go on exploring one life is not enough for photoshop. unlimited oppertunaty for those who actually know it but the mistry is nobody know photoshop from the heart. I use Splashup. It is an online image editor. http://splashup.com. click on jump right in. It depends on what my purpose for my pictures are. but usually usually I use ACDSee Photo Manager for organizing and simple editing: cropping, color correction, levels etc. For working with RAW, I use ACDSee pro 2. Although they have a pro 2.5, I haven't upgraded yet. I use Photoshop 7 and Nik. I have the photoshop elements but I have not used it yet. I use AC/DSee. I started using it when I got a Pentax camera, and have continued with pentax and AC/DSee. It is easy to use, and is relatively quick, good since my problem is time! What a great question! I am a serious, will-always-be-amateur photographer, using a Nikon D80 for the past four months--my first DSLR. I began using Picasa 3 that I found very good for my purposes, but I switched to Picnik, also a superb photo-editing operation, because my favorite photography website (dPS is a strong second) FLICKR teamed up with Picnik. A related question (if anyone can respond to it): Nikon sent me a 60 day trial version of its photo editing program, 'Capture NX2' , but I really couldn't take advantage of it because it isn't "simple" enough for me. Now I wonder if programs like this are for RAW enthusiasts--something I know very little about. Irfanview for batch editing, photoimpression4 for layers. Day to day crop etc, Microsoft Photo Editor. I am a Canon user and normally shot RAW formate which is saved under the origial numbering then I make what corrections seem needed in Canon Photo Professional (RAW converter program). Next, convert to JPEG and work in Photoshop Elements 4 and print. I hope to someday purchase a program with more options than what I have to work with but with the budget I am getting some nice end results with what I have. Lightroom but i also use LightZone a lot ,i have Photoshop but since i got onto LightZone i don't use PS so much and i could live without it. Adobe Photoshop Lightroom is a photography software program developed by Adobe Systems for Mac OS X and Microsoft Windows, designed to assist professional photographers in managing thousands of digital images and doing post production work. It is not a file browser like Adobe Bridge, but rather an image management application database which helps in viewing, editing, and managing digital photos (including those on backup DVDs). Lightroom allows you to import and review your photos quickly, assign keywords and metadata to them, edit them (change white balance, exposure, etc. ), print them, and create slideshows/web galleries from them. It differs from Photoshop (and, I presume, Photoshop Elements) in that it is an image management program rather than an image editor. Lightroom's in-built editing tools save many trips to Photoshop—but they don't replace Photoshop. P.S. I actually use a Apple's Aperture, which is a similar program to Lightroom, but with a slightly different workflow and interface. Picasa works fine for basics like red eye reduction or correcting lines, but for bigger jobs GIMP is the way to go - I haven't found anything you can't do in GIMP that you can in CS2, the price is right, and you support opensource software. Of course, I've only been taking and edit photos for about a year, so take these recommendations with a grain of salt. Can someone please explain in detail the salient differences, pros and cons between Lightroom and Photoshop Elements? I'm proficient enough at Elements to covet CS4, but wonder if Lightroom is something I should also look at. Thanks for any help. I just changed laptops, and tried to get my Picasa settings to go with the pictures. Most of it went just fine, the captions and geotagging were copied, but it did not transfer over my albums. They are stored as lists, with extra info, in the hidden data sections under the profiles in Windows. Since I was transferring from XP to Vista, and the paths for the pictures are different, that may have been the problem. I like the way it works for organizing, but I don't like being tied to the idiosyncrasies of its data storage. That is probably true for most of these programs. I use Capture NX 2 for processing my Nikon RAWS (NEF) and view/transfer pictures with ACDSee Pro 2.5. Capture NX 2 is perfect for NEF processing, it will read all data as your camera. I recommend anyone using Nikon NEF to try this software. actually, I use mostly photoshop express as it was included in my scanner's package. it runs completely in your browser, has layers and everything. Though the GIMP was my favourite, for the past few weeks I've started to play with both 'krita' and 'cinepaint' - both of these applications run on Linux and have support for 8, 16 (and in some cases) 32 bits per channel colourspace. To be honest. I do everything in Corel PhotoPaint. I've been working with it since version 5.0 and it's now running version 14th (called X4). I am just too used to it so as to jump over PhotoShop. I can't believe no one has mentioned CaptureOne 4 by PhaseOne. Simple and quick to use, yet powerful with great results. I couldn't afford Lightroom, but I'm glad I chose CaptureOne 4 for my RAW processing. Also using iView MediaPro (later developed into Microsoft ExpressionMedia) for cataloguing and IPTC tagging. And I don't have Photoshop, but occasionally edit in the GIMP or in Picnik.com. I encourage those who are feeling limited by a free product and are unwilling to spend the big $$$ for Photoshop to seriously consider Photoshop Elements. 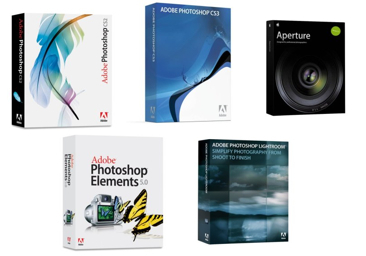 Adobe has done a great job of extracting most of the still image tools from Photoshop and packaging them at a far more reasonable price. I just Googled the two and Photoshop goes for about $500 while Photoshop Elements ranges from $60 to $80. I am now learning and using Lightroom. I am also using Photoshop Elements for advanced editing. I have been using various imgae programs for years. Recently I began using Capture NX2 and it is hard to beat. It is really easy to learn and produces great images. I just don't have the time to do much with Photoshop and similar products on each photo. NX2 make it quick. Just purchased Photoshop Elements 7.0, very nice product. Although it sure doesn't have all the bells & whistles of CS3, which in my book is too darn expensive for what I do. All my friends use torrents to download the software for free, for some reason I can't bring myself to do that. I use Capture One 4. I shoot mostly in RAW and I find Capture One most intuitive and providing outstanding results. I use linux but for post processing I switch to windows and run my C1. If I am to do some additional post-processing work, which happens very seldom as I try to do as much as possible before i take the picture, I use Photoshop CS2. I am now planing to explore the capabilities of Gimp under linux. I find Adobe software is unreasonably expensive and would not purchase another license from them. Photoshop CS3 for the other 2-5% of more complex editing tasks. Interesting poll, great site, thanks. I'm annoyed about the fact that Adobe don't release Camera Raw updates for older Photoshop versions. After upgrading to a Canon 50D, I found that the versions of ACR that support the 50D will not work with Photoshop CS2! I use Photoshop CS3 most of the time. Recently I started using Lightroom 2.0 as well but I'm still a novice with it. I use DxO Optics Pro on every photo for RAW conversion and basic corrections. I absolutely love the look and the simplicity, just wish they'd finish up with the lens modules for the other lenses I own. I also use DPP (canon bundled) fairly frequently, but that's more for just browsing RAWs, and as soon as my order for Lightroom2 comes in I doubt I'll open it again. I use ACDSee Photomanager 10. I have downloaded numerous trial versions of the others, but this one remains my favorite. It is easy to use and fast. It is also great image organizer and I am always discovering new and useful features... a great bargain too. Aperture 2.0!! I love it's workflow and tools. The plugins make it even more useful. I'm surprised more people don't use GIMP (although this site is heavily geared towards PS). So my question is: why not? I normally use digital photo professional,which is the software with canon SLRs. On occasion,I'll use photoshop elements 6 but its not very often I even need it. I'm so in love with all of the amazing extras that version 2 offers....it's sleek, organized, beautiful, easy to use and so intuitive when it comes to a photographer's workflow. Capture NX2 (because of non-destructive editing and multiple version capability within one file) for editing, cropping and publishing to jpg. Picasa for viewing the published photos and uploading to the Picasaweb photosharing site. Corel Photo-Paint 8 (it's 10 years old, but it's paid for) in case I want to do something that Capture NX2 can't, such as pasting other objects or text into the picture. I find that I use DxO and PS CS4 about half and half. I wonder if you might write a post about what Picasa does with your files. I used it on my last laptop and it confused my so much that now that I have a new PC, I'm afraid to download it and end up with numerous duplicates of folders, never knowing whether a photos changes are saved or just temporary. I love the actual application, but it just doesn't see to follow a normal file structure. My main sources are Picnik (through FlickR) and Photoshop Express (which is free online). When I want to do crazy intense things I use Gimp. Bibble Pro 4, but soon Bibble Pro 5 which has *finally* been release as a beta. Also, Photoshop CS3. I use Aperture for cataloguing my photos, but although I've started to use Aperture's in-built adjustment tools on some photos, I prefer to use Photoshop CS3 (with Adobe Camera Raw) for most photos. My favourite thing about using Photoshop/Camera Raw is that from Camera Raw I can open a photo in Photoshop as a Smart Object, apply various adjustments to it [in Photoshop], go back to Camera Raw to edit some of the settings (by editing the Smart Object), and return to my Photoshop document where the Camera Raw changes take effect but my Photoshop adjustments remain intact. I'm currently using Picasa for basic editing and cropping and Gimp when I need to resize or want to play with filters Picasa doesn't have. But I've used Photoshop Elements for years and just need to pick up a new version that will work on my new laptop (Vista). 3- Photoshop: when I need advanced modification. I am using CS4 and Lightroom... In both program I can view RAW and change them into TIff or Jpeg. Though I just downloaded Lightroom and am giving it a shot for the duration of the trial. We will see if it wins me over. I use "PhotoScape" as a quick and powerful little windows app for basic photo post processing. aperture 2.0 fits 95% of my needs. ACDSee Pro. Simple, lightweight, and effective program. I really want to give Lightroom a chance because of the filters, however, they've made Lightroom overly complicated for non-Adobe users. 1. Picasa for organizing and occasional light editing. 2. CS3 for anything else. 3. Paint Shop Pro once in a great while. Still think its a great inexpensive program! Bibble all the way. Well, frankly when I have to go to details I use CS4, but am waiting for Bibble 5 to come out, with all the layers and PS-like stuff. Then I guess no more Adobe for me, I guess. I really love the speed and versatility of Bibble 4.10 already and can't wait for the 5.0 to be released. I use Picasa for the easy stuff, but I haven't yet figured out which software would suit me for RAW. This post though certainly gave me a lot of ideas! In Windows I use Lightroom for organizing and minor edits and Photoshop for all the heavy stuff. In Linux I use Picassa for organizing and minor edits and The Gimp for medium stuff (I will usually switch to Windows for any major editing and use Photoshop CS3). Xiao - You're correct. But it interfaces nicely with Adobe Camera Raw. Since I shoot NEF (RAW) 90% of the time, I'm not sure I can do minor touchups (except exposure, and other RAW tweaks) in lightroom either. Am I correct? A good 6months ago I used Imatch and Photoshop cs3 as a combination for postprocessing and organizing my pictures. Then (because I had enough time due to a broken fibia) I tried lightroom 2, and now the db I had in Imatch is converted to Lightroom and I do more of the standard post processing in lightroom and photoshop gets less and less work. For more complex pp work I'm using photoshop cs4 and compared with the cs3 the "gpu" is a great enhancement of the program, that alone makes the upgrade worth it. I'm using those programs on windows xp, windows vista basic and windows vista ultimate without any problems. I use ACR5 for 95% of my stuff and PS-CS4 for the rest. I use Lightroom for almost everything, joining it with Photoshop CS3 if some sensitive touch-up is required. I spend most time in Lightroom and a fair chunk in PS CS3 but also use Photomatix Pro 3.1 a great deal, both for HDRs and for minor rework of NEF files. I actually prefer PS CS3 over CaptureNX. As for lightroom, since I have CS3 with Bridge - is there really really an advantage to getting lightroom? I have been considering it for a long time. I use PhotoScape a lot. I'm seriously missing Bibble in the list! I voted Lightroom, but I also use PSCS2, PSPX2, and Picassa - depending on which computer I'm using and what my processing needs are. pixelmator/ all the way for me ! When I got my first DSLR, I used the supplied software to handle the RAW files (Canon Digital Photo Professional). However, as my photo library grew, the software just couldn't cope with it, and I was getting so out of depth with the labyrinthine filing system, I began scouting for alternatives. I ended up with Aperture (being a Mac user), although I could easily have moved to Lightroom. I now have the capability to locate images very quickly through keywords, smart albums, ratings, or combinations of several tagging elements. I don't use Photoshop that much now, except for specific tasks I cannot perform in Aperture. I'm thinking of stuff like cutting out a subject from the background, or retouching beyond just removing dust specks and hairs, etc. 1. For fast-and-dirty editing of family or party photos and for organizing all I use is Picasa3. 2. When I shoot RAW, I use Lightroom for PP and conversion to other formats. 3. But none of above give me the ability to work with layers, which is why I turn to GIMP on many occasions. So, ok - GIMP and Picasa can work with RAWs but Lightroom does it so much better. Picasa is good with processing a lot of photos quickly and for organizing them, but it fails to give you a feel of control over the process, that's why I go elsewhere, when the photo requires more than crop and automatic brightness/contrast/color balance. Finally GIMP is way to complicated to use it as a first-line editor and organizer. I was using Bibble Pro for the duration of a trial period and I must say that it is at least as good as Lightroom and in my opinion - it gives you more abilities with less "watch my beautiful interface" thing which only brings an extra load to your processor. I usually use Picknik. It's quick and easy and fun. I don't usually do super in-depth or extensive post-processing, so it suits my needs. Every photo, first goes through NX. Saved to TIFF. The TIFF goes to CS3. Saved to PSD. From there, adjusted to internet use i.e cropped, re-sized etc. As a new amateur photographer I use Picasa most of the time, while maybe not the best at viewing image quality it does a pretty bangup job. It's easy to share photos with family and friends, upload to facebook, and offers enough image editing for the layman all at the right price (FREE!) I do have Lightroom 2 and am slowing working through the learning curve. I use a a simple graphics program called Paint.NET for the PC. It's not tailored for use on photos, but it does color correction and cropping correctly. I just received my copy of Lightroom 2, so I'm looking forward to trying that program out. I'm a Photoshop 7.0. Someday I hope to upgrade, but as I am pretty much still a novice, this works fine for me. I think Capture NX(2) misses from the list. It's pretty important. Nikon users prefer it for a NEF-only (or at least no TIFF) workflow. I'm not doing much post-processing, and using linux limits my choices... So I'm mostly using the (really basic) integrated functionnalities of my photo management software, and sometimes I'm launching the Gimp. DxO, for batch correcting optics defects and overall easy and intuitive processing.